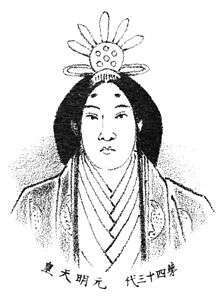 Empress Genmei (元明天皇, Gemmei-tennō, 660 – December 29, 721), also known as Empress Genmyō, was the 43rd monarch of Japan, according to the traditional order of succession. Genmei's reign spanned the years 707 through 715. In the history of Japan, Genmei was the fourth of eight women to take on the role of empress regnant. The three female monarchs before Genmei were Suiko, Kōgyoku/Saimei, and Jitō. The four women sovereigns reigning after Genmei were Genshō, Kōken/Shōtoku, Meishō, and Go-Sakuramachi. Before her ascension to the Chrysanthemum Throne, her personal name (imina) was Abe-hime. Empress Genmei was the fourth daughter of Emperor Tenji; and she was a younger sister of Empress Jitō by a different mother. Her mother, Mei-no-Iratsume (also known as Soga-hime), was a daughter of Udaijin Soga-no-Kura-no-Yamada-no-Ishikawa-no-Maro (also known as Soga Yamada-no Ō-omi). Genmei became the consort (nyōgo) of Crown Prince Kusakabe no Miko, who was the son of Emperor Tenmu and Empress Jitō. After the death of their son Emperor Monmu in 707, she acceded to the throne. At least one account suggests that she accepted the role of empress because Emperor Mommu felt his young son, her grandson, was still too young to withstand the pressures which attend becoming emperor. 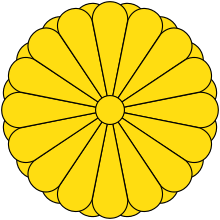 July 18, 707 (Keiun 4, 15th day of the 6th month): In the 11th year of Mommu-tennō 's reign (文武天皇十一年), the emperor died; and the succession (senso) was received by the emperor's mother, who held the throne in trust for her young grandson. Shortly thereafter, Empress Genmei is said to have acceded to the throne (sokui). 708 (Keiun 5):, The era name was about to be changed to mark the accession of Empress Genmei; but the choice of Wadō as the new nengō for this new reign became a way to mark the welcome discovery of copper. The Japanese word for copper is dō (銅); and since this was indigenous copper, the "wa" (the ancient Chinese term for Japan) could be combined with the "dō" (copper) to create a new composite term – "wadō" – meaning "Japanese copper." May 5, 708 (Wadō 1, 11th day of the 4th month): A sample of the newly discovered Musashi copper from was presented in Genmei's Court where it was formally acknowledged as "Japanese" copper; and a mint was established in Ōmi Province. 708 (Wadō 1, 3rd month): Fuijwara no Fuhito was named Minister of the Right (Udaijin) . Isonokami no Maro was Minister of the Left (Sadaijin). 709 (Wadō 2, 3rd month): There was an uprising against governmental authority in Mutsu Province and in Echigo Province. Troops were promptly dispatched to subdue the revolt. 709 (Wadō 2, 5th month): Ambassadors arrived from Silla, bringing an offer of tribute. He visited Fujiwara no Fuhito to prepare the way for further visits. 710 (Wadō 3, 3rd month): Empress Genmei established her official residence in Nara. In the last years of the Mommu's reign, the extensive preparations for this projected move had begun; but the work could not be completed before the late-emperor's death. Shortly after the nengō was changed to Wadō, an Imperial Rescript was issued concerning the establishment of a new capital at the Heijō-kyō at Nara in Yamato Province. It had been customary since ancient times for the capital to be moved with the beginning of each new reign. However, Emperor Mommu decided not to move the capital, preferring instead to stay at the Fujiwara Palace which had been established by Empress Jitō. Empress Genmei's palace was named Nara-no-miya. 711 (Wadō 4, 3rd month): The Kojiki was published in three volumes. This work presented a history of Japan from a mythological period of god-rulers up through the 28th day of the 1st month of the fifth year of Empress Suiko's reign (597). Emperor Tenmu failed to bring the work to completion before his death in 686. Empress Genmei, along with other court officials, deserve credit for continuing to patronize and encourage the mammoth project. 712 (Wadō 5): The Mutsu Province was separated from Dewa Province. 713 (Wadō 6, 3rd month): Tamba Province was separated from Tango Province; Mimasaka Province was divided from Bizen Province; and Hyūga Province was divided from Osumi Province. 713 (Wadō 6): The compilation of Fudoki was begun with the imprimatur of an Imperial decree; and copies of the census of the provinces of Izumo, Harima, Hitachi and two other provinces still exist. This work was intended to describe all provinces, cities, mountains, rivers, valleys and plains. It is intended to become a catalog of the plants, trees, birds, and mammals of Japan. It also intended to contain information about all of the remarkable events which, from ancient times to the present, have happened in the country. 713 (Wadō 6): The road which traverses Mino Province and Shinano Province was widened to accommodate travelers; and the road was widened in the Kiso District of modern Nagano Prefecture. After Empress Genmei transferred the seat of her government to Nara, this mountain location remained the capital throughout the succeeding seven reigns. In a sense, the years of the Nara period developed into one of the more significant consequences of her comparatively short reign. Genmei had initially planned to remain on the throne until her grandson might reach maturity. However, in 715, Genmei did abdicate in favor of Mommu's older sister who then became known as Empress Genshō. Genshō was eventually succeeded by her younger brother, who then became known as Emperor Shōmu. 715 (Wadō 8): Genmei resigns as empress in favor of her daughter, who will be known as Empress Genshō. The Empress reigned for eight years. Although there were seven other reigning empresses, their successors were most often selected from amongst the males of the paternal Imperial bloodline, which is why some conservative scholars argue that the women's reigns were temporary and that male-only succession tradition must be maintained in the 21st century. Empress Genmei, who was followed on the throne by her daughter, remains the sole exception to this conventional argument. After abdicating, she was known as Daijō-tennō; and she was only the second woman after Empress Jitō to claim this title. Genmei lived in retirement for seven years until her death at the age of 61. The actual site of Genmei's grave is known. This empress is traditionally venerated at a memorial Shinto shrine (misasagi) at Nara. The Imperial Household Agency designates this location as Genmei's mausoleum. Genmei's Imperial misasagi or mausoleum can be visited today in Narazaka-cho, Nara City. The "mountain shape" misasagi was named Nahoyama-no-higashi no misasagi. Our captain must be ranging the shields to drill the troops. Next of kin to yourself? The years of Genmei's reign are more specifically identified by more than one era name or nengō. 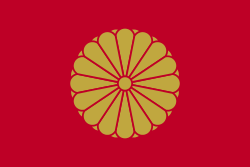 1 2 Imperial Household Agency (Kunaichō): 元明天皇 (43); retrieved 2013-8-22. ↑ Titsingh, Isaac. (1834). Annales des empereurs du Japon, pp. 63–65, p. 63, at Google Books; Brown, Delmer M. (1979). Gukanshō, p. 271; Varley, H. Paul. (1980). Jinnō Shōtōki. p. 140. ↑ Brown, pp. 264; prior to Emperor Jomei, the personal names of the emperors (imina) were very long and people did not generally use them. The number of characters in each name diminished after Jomei's reign. 1 2 3 4 5 6 7 8 Brown, p. 271. 1 2 3 4 5 Ponsonby-Fane, p. 56. 1 2 3 4 Titsingh, p. 63. ↑ Brown, p. 271; Varley, p. 44; a distinct act of senso is unrecognized prior to Emperor Tenji; and all sovereigns except Jitō, Yōzei, Go-Toba, and Fushimi have senso and sokui in the same year until the reign of Go-Murakami. 1 2 3 4 5 6 7 8 Titsingh, p. 64. ↑ Titsingh, p. 64; Aoki (1989: 149)Aoki, Kazuo et al. (1989). Shin Nihon Koten Bungaku Taikei 12: Shoku Nihongi I, p. 149. (in Japanese). 1 2 3 Varley, p. 140. ↑ Nippon Gakujutsu Shinkokai. (1969). The Manyōshu, p. 81 n1; elbow guards were made of leather and were worn on the left arm to prevent the bow-string from springing back and hurting the elbow. The string struck the elbow-guard with a loud sound. ↑ Nippon Gakujutsu Shinkokai, p. 81 n2; this poem probably alludes to the expeditionary force that was sent against the Emishi in northern Japan in 709 (Wadō 2). 1 2 Nippon Gakujutsu Shinkokai, p. 81. Aoki, Kazuo; Kōji Inaoka; Haruo Sasayama; Noriyuki Shirafuji (1989). Shin Nihon Koten Bungaku Taikei 12: Shoku Nihongi I (in Japanese). Iwanami Shoten. ISBN 4-00-240012-3.